Home TRAVEL ABROAD Asia Destinations China-Thailand 2010 2/07/10 NI HAO FROM CHENGDU CHINA !!! 2/07/10 NI HAO FROM CHENGDU CHINA !!! 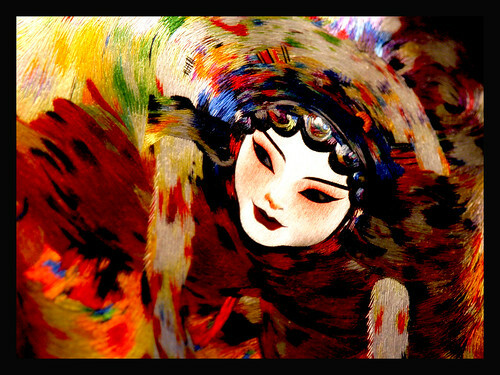 ABOVE IS A PHOTO I TOOK OF SHU EMBROIDERY DEPICTING THE SICHUAN OPERA/FACE CHANGING in 08. Below you will find all sorts of interesting facts and destinations in Sichuan Province and the city of Chengdu which we will be checking out this week!!! WE ARE HERE IN CHENGDU!!! Arriving just before noon from a short overnight layover in Beijing with the day ahead of us to unwind, stretch out…and get our bearings at our awesome hotel we got at a fantastic rate… the BUDDHA ZEN! “Buddha Zen Hotel was born with excellence and continues creating marvels without any counterpart. The tranquility included in the traditional culture is showcased by the active modern expressions. Surrounded by the noisy metropolitan culture, you still have a chance to experience an eremite’s life in the hotel, where you can have vegetarian meals in Rong Zhai Restaurant, enjoy sauna in Zi Zai Spa, talk about doctrines in Jian Cha Teahouse, and get a good rest in any one of the thirty five guestrooms which are deliberately decorated with Buddha Zen style and the first choice for Buddhist dignitaries, Buddha-worshippers, and high-end business persons. Each of the underlined links below contain a wealth of info for the armchair tourist!!! Enjoy and be looking for new audio and video updates as they come in ! Chengdu is the capital of “Heavenly State” (Tian Fu Zhi Guo), habitat of giant pandas and city of cotton-rose hibiscus. Benefiting from Dujiangyan Irrigation Project which was constructed in 256 B.C., Sichuan Province is reputed as “Tian Fu Zhi Guo”, literally a place richly endowed with natural resources. Chengdu, as the capital, is extremely productive. The Min and Tuo Rivers, two branches of the Yangtze River, connected to forty other rivers, supply an irrigation area of more than 700 square kilometres (270.27 square miles) with 150-180 million kilowatts of water. Consisting of abundant mineral resources, the land is extremely fertile. The history of Chengdu can be traced back 2,400 when the first emperor built his capital here and named the city. Through thousands of years its original name has been kept and its position as the capital and as the significant center of politics, commerce and military of the Sichuan area (once called Shu) has remained unchanged. Since the Han (206B.C.-220) and Tang (618-907) Dynasties when its handicraft industry flourished, Chengdu has been famous for its brocades and embroideries. Shu embroideries still enjoy a high reputation for their bright colors and delicate designs, ranking among the four main embroideries in China. Chengdu was the place where the bronze culture, an indispensable part of ancient Chinese culture, originated, the place where the Southern Silk Road started, and the place where the earliest paper currency, Jiaozi (not the dumpling! ), was first printed. It is listed among the first 24 state-approved historical and cultural cities and owns 23 state and provincial cultural relic units. In addition to its profound historical and cultural background featuring historic places of interest such as the Thatched Cottage of Du Fu , Wuhou Memorial Temple and Wenshu Monastery , etc, natural beauty abounds in surrounding areas such as in the Jiuzhaigou Scenic Area and Huang Long Valley (Yellow Dragon Valley) . The natural habitat of giant pandas, Chengdu Panda Breeding and Research Center , supports the world’s only giant panda breeding and research base. Click map thumbnail to see the larger Google map! BE SURE TO CHECK THE AUDIO AND VIDEO UPDATES BELOW DURING THE COURSE OF THE DAY FOR ANY “ON THE FLY” POSTINGS. TONIGHT WE WILL DO A FULL REPORT FROM THE BUSINESS CENTER OR INTERNET CAFE COMPLETE WITH PHOTOS!!! Will keep checking back for more news.. I definitely need the distraction. Hi Sandra, Please check on our little Mei Lan! She is not eating and is really freaked out. Tai is doing better but of course we want to see him too. I know you will take lots of photos and I can’t wait to see them. Blow Tai and Mei kisses from me. Have a safe and fantastic trip! Keep an eye out for puppy pictures-sent a few of them at 2 1/2wks. I sure hope you are having fun! Like I’m JEALOUS!!!! Watching your helebore video makes me wish I could fast forward about 8wks to our spring. Hope you can post from your adventures. yaaaaaaaaaaaaaaaaaaay……you have arrived!!! wow….what an awesome hotel. i can feel the zen from here. ahhhhhhhhhhh. i will go to bed, close my eyes and pretend im in that gorgeous bed!!! this is gonna be fun!!!! so happy you are there safe and sound… Kiss my baby for me tomorrow!!! The hotel looks fabulous. Please check on our beloved Tai Shan and let us know how our precious Mei Lan is doing. I hope that she is eating. Hi Sandra! We were so glad to read that you arrived safe and sound and see the photos of the lovely accommodations….enjoy those wonderful pandas!